Previously, on MinerBumping... The New Order was stunned when Ledrian Saisima revealed himself as a spy after buying 220 million worth of shares and contributing 500 million to another Agent of the New Order's corp. Hoping to find answers, I initiated a private convo with Ledrian. He explained that his espionage was merely a way to get my attention and propose a daring new plan of action. Ledrian was more ambitious than anyone realized. 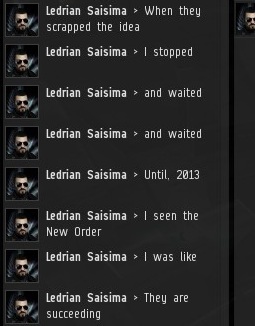 He intended to help the New Order conquer the entire EVE galaxy, not just highsec. 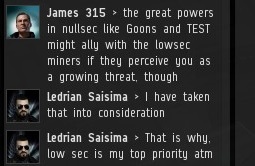 The centerpiece of his plan involved an attack against the lowsec miners. This wasn't some half-baked scheme. No, Ledrian had been baking it for an extended period. 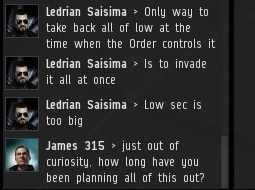 By driving the miners out of lowsec, they would have few alternatives but to return to highsec, which would already be securely in the grip of the New Order. 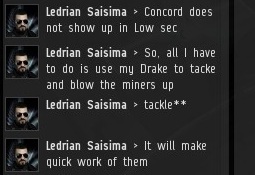 Ledrian was confident that the lowsec miners would be unable to withstand his powerful anti-exhumer Drake. So far, so good. But I wanted to see if there were any flaws in his master plan. 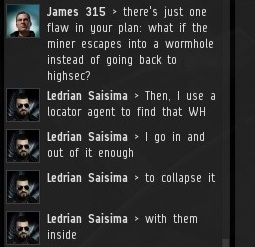 Ledrian's unorthodox use of locator agents to search out the wormholes was intriguing. Clearly he had thought of everything. 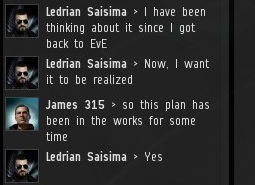 With highsec, lowsec, and wormsec all taken care of, we were almost ready to use Ledrian's Drake to take over EVE. But I was concerned about nullsec. 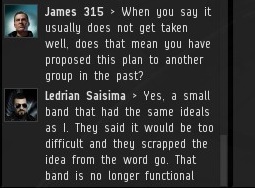 Ledrian admitted that the nullsec alliances might pose a problem. 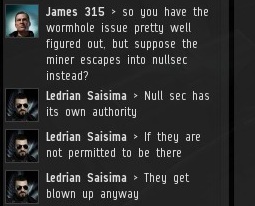 The key was to do enough damage to the lowsec miners before they could join forces with nullsec. Once lowsec fell under our power, and with wormhole space crawling with Ledrian's locator agents, the nullsec alliances would find themselves surrounded. This isn't the kind of thing you can plan out over a long weekend. Ledrian spent two years plotting and biding his time. When he learned of the New Order, he moved quickly to seize the opportunity. Ledrian knew he would have difficulty being taken seriously. To make the leap from unknown EVE player to galactic strategist, he would need to make a bold move. 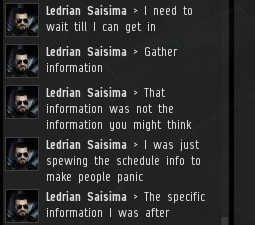 By infiltrating the New Order, he got himself on the Saviour of Highsec's radar. Now he was in a position of influence. Chaos is a ladder. Years earlier, Ledrian tried playing by the rules, offering his plan to his own corp. But they lacked the ambition and vision to carry it through. Ledrian's failure to convince his corp to take over the galaxy was a setback. He was down, but not out. From the shadows, he watched, and he waited. In the midst of his soliloquy, Ledrian dropped another bombshell. Contrary to his earlier claims, he wasn't interested in learning the "schedules" of the New Order's Agents. He had far more valuable intel to collect. But what was it? Ledrian's anti-exhumer Drake... the New Order's ultimate weapon! Locator agents in wormholes ahahahaha!!! This storyline is approaching "critical retard" (an intellectually deficient version of "critical mass" - referring to the so-called "spaimaster", of course, not our beloved Savior). Please abort. I'd rather have a bonus dose of the Grab Bag, tbh - tears never go stale. the panic caused by revealing schedules must have been damaging enough, who knows what will be further revealed?!?!? 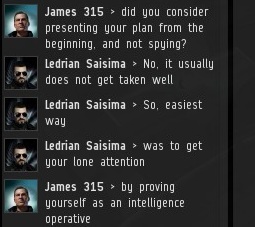 "critical retard" should be the name of Ledrian's lowsec Drake corp.
Because once you locait miners in a wormhole with a locater agent, once you collapse the wormhole they all die you big dummy. Dont you no nething? I wonder if anyone gets these clever titles. They're full of citations! Every single Saviour's word lays a path to knowledge. They are beyond the comprehension of mere mortals. 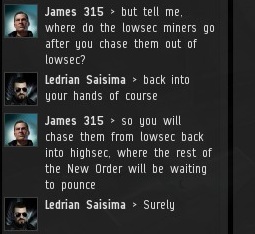 Two years of planning and still he missed that there are practically no miners in low sec. 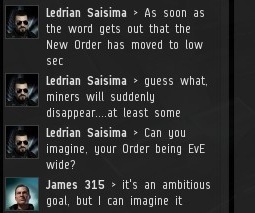 He also missed that the goal of the New Order is among other things to bring more miners to low sec. And that his two years master plan involves nothing more than doing what every low seccer tries to do every day just for fun, ganking. Personally i am 100% sure that if he takes his drake to low sec a successful gank will follow shortly after. Also a big shoutout to Steve 316 who if anything has thought things through even less than that Ledrian genius. Loved the show tonight. Hope i catch your next gig. Whoa, do you have screenshots/chatlogs?